I feel like I've been making this on and off for years now but have never posted it? I don't know. I can't actually remember. I do know I likely started making it when we had a supply of zucchini and tomatoes from the garden, so it was likely a quick summer dinner when I thought of it. 1. It's a one pan dinner. 2. It's 5 basic ingredients. 3. It takes about 30 minutes. Maybe less. I didn't time it. 4. Absolutely perfect for a school night because meatless dishes are generally quicker...we do at least one meatless meal a week anyway. It's just so. much. easier. 5. Leftovers would be perfect to take to work as lunch the next day. In a cast iron or ovenproof skillet, heat a few tablespoons of olive oil over medium heat. Add the gnocchi and allow it to brown and crisp up, about 5 minutes. Stir often so it doesn't stick to the pan or burn. 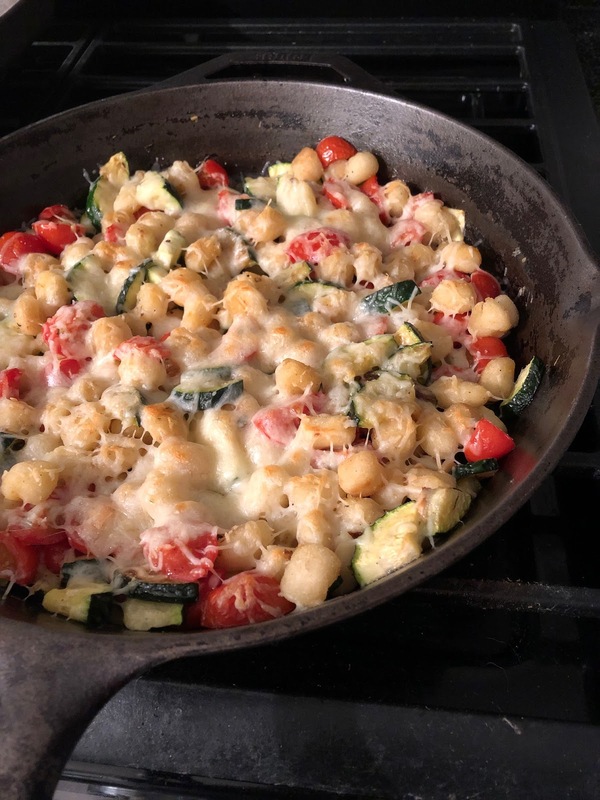 When the gnocchi is crispy and golden brown, remove it from the pan and set it aside. Heat a few more tablespoons of olive oil and add the zucchini. Sprinkle on the basil and oregano and allow the zucchini to brown. Keep the heat on medium-high so it browns and doesn't just soften. Make a space in the center of the pan and add the garlic, allowing the slices to brown a bit on each side. Add the gnocchi back in and stir. Top with cheese and broil until the top is browned. This looks amazing and hearty. Im low carb these days but still really yummy. Yep Yep Yep.... adding this to my list to make. I LOVE me some gnocchi!!! Yum!!! One pan meals are my absolute favorite. SOLD. this looks amazing. i don't think i've ever tried or seen mini gnocchi. This sounds delicious. I love one-pot meals, and Sean and I could stand to go meatless now and then.